Electric Car Batteries: Lead or Lithium? Which electric car batteries do you need for your conversion or other electric vehicle? There are several different chemistries now available (some more available than others!). 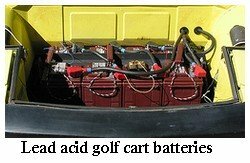 We'll talk about lead acid golf cart batteries, nickel-based batteries, and a couple of different lithium ion batteries - including LiFePO4, my new personal favorite - and what kind of batteries NEDRA drivers put in their electric cars these days. 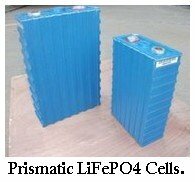 By far the most popular and widely available electric car batteries are the deep cycle lead acid batteries. 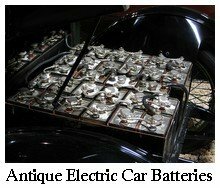 What's Good About Lead Electric Car Batteries? A 120v system will need 20 6v golf cart batteries, and they'll cost you 100-150 USD each; that's 2K-3K. You can get your lead acid batteries locally from a golf cart battery dealer, which saves you the shipping costs. Batteries are heavy and contain metals that are usually toxic, one way or another, and that translates into expensive shipping. Setting aside the issue of high-voltage safety practices for a minute, lead acid batteries are relatively safe no matter what you do to them. They can leak sulfuric acid in a crash, they can vent flammable gases when they are charged, but they are generally considered to be pretty safe batteries. What's Not So Good About Lead Electric Car Batteries? 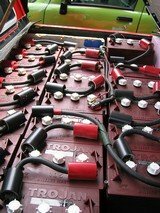 When you hear about lead's lower energy density than other battery chemistries like lithium, it's easy for our brain to form a picture of a SLUG that can barely get away from a stoplight at 2 mph before it needs a charge again, but really, it only means that an adequate number of batteries will weigh more. What this means in practice is that you'll need to choose between extra batteries or the ability to carry more passengers. If my observations of freeway traffic are any indication, we didn't really want the passengers anyway. They don't have the same number of theoretical cycle lives as other battery chemistries. Lead batteries don't like lead FEET. Lead acid, more than lithium, will make you pay dearly in range for your freeway acceleration. If you're using a DC motor in your conversion, you'll get considerably less range than with the AC conversion, too. The "lead foot tax", aka the Peukert effect, seems to be less of an issue with lithium. ...and we're not particularly responsible in our disposal of it. Lead is too toxic to recycle in the US, the liability issues make it too expensive, so our lead battery recycling program consists of shipping the batteries overseas for other people's children to disassemble and melt down for resale. "(Regarding electric cars) the news IS the batteries. Instead of 30 miles range (as with lead), we get 80-100 quite easily. And instead of 24 months, we can get 10 or 12 years from them. They are a miracle." Jack has put these LiFePO4 cells in his DC conversion, with a motor from NetGain, and also in an AC conversion with a motor from HPEVS. Each system is getting 80-100 mile range. With lead, there would be a marked difference between the range he could get from his DC conversion (less!) and his AC conversion (more!) under normal driving conditions. You've probably heard that we don't really have NiMH EV batteries anymore. You can get NiMH batteries, but the large format NiMH that is suitable for electric cars is presently a patent hostage being held by Chevron. Doug Korthof, someone you might have seen in the film Who Killed the Electric Car?, talks in this video about his Toyota Rav-4's NiMH battery pack, which gives his car around a 100 mile range, like lithium, and has lasted over 100,000 miles so far on the original batteries, by the way. Lithium is great, but 100,000 miles? No wonder the gas companies killed the NiMH electric car. Note on the Toyota hybrid NiMH batteries: they are not designed for deep discharge, if you find some and decide to put them in an electric car. 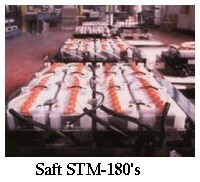 They're more like the SLI lead-acid batteries than the NiMH EV batteries. The hybrid batteries will die young if pressed into service as EV batteries. ...and get a set of very inexpensive, excellent EV batteries that will last a very long time. If you go this route, keep in mind that NiCad batteries have KOH electrolyte instead of acid, you'll want to recycle the batteries at the end of their EV life (no cadmium in the landfill, please! ), and the NiCad charging profile is a little different than lead or lithium. John Wayland - aka Plasma Boy, don't ask - has had lead acid batteries in his electric race car, the White Zombie, for a long time. But not anymore. 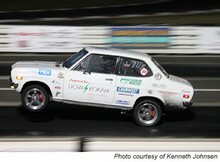 Recently, he's made NEDRA headlines by installing lithium polymer cells in that quick little DC powered Datsun (two DC motors, actually) and driving from Portland to Seattle and back (no, not without recharging!). Mr. Wayland is slightly notorious for his lead foot and his stereo, so I'm thinking you can credit the batteries for the long range. From NEDRA news, June 2011: "The Zombie has a range of just over 100 miles with it's Dow Kokam Lithium Polymer battery pack and will be making three short charge stops to juice up along the way....who would have thought you can drive a street legal 10.2 second electric car over 100 miles on it's own power?" 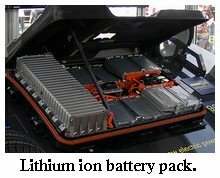 Part 2 of Electric Car Batteries: Lithium!